A murder investigation is under way after a 16-year-old boy was stabbed to death in a park. The boy was found with stab wounds in Sara Park in Small Heath, Birmingham at about 20:00 GMT on Wednesday and pronounced dead at the scene. 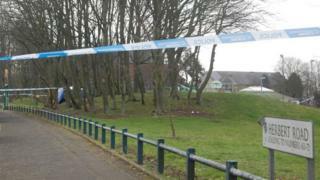 Another boy, 15, suffered minor injuries during an assault at the park in Herbert Road, police said. A cordon has been put in place but no arrests have been made. The force has appealed for witnesses. Det Ch Insp Edward Foster, from the homicide team, said: “A teenager has sadly lost his life and another was assaulted. Mark Crooke, from the Pritchett Tower residents’ association chairman, said: “Today is a sad day because of the young man losing his life. People are feeling very vulnerable and scared. The boy’s death came one week after Mohammed Sidali, 16, was fatally stabbed outside Joseph Chamberlain College in Highgate. Another 16-year-old boy was stabbed in the stomach on Oxford Road, Smethwick, on Sunday.